Ready to print and use games. You will be having fun in minutes. 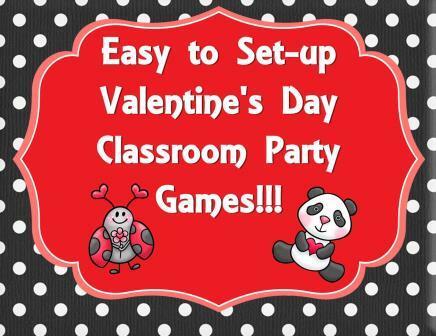 FIVE + great Valentine’s Day Classroom Party games that are super easy to set-up. Get it now and be ready to play in less than an hour. Pages 3 to 5—Fill my heart to BEE my Valentine Game! You must supply markers but only set-up required is to print and cut-out a set of cards!!! Be the first to fill you heart by covering all the circles. To play: Players take turns in order drawing 1 card and performing the act on the card. For example: If the card says +3, then the player would add 3 pieces to their heart. If the card asks the player to give a piece away, they must give one piece away, if they have the piece to give. If they do not have any pieces on their heart, they do nothing and it is the next persons turn. Play continues until someone covers up all the circles on their heart! Grades Pre-K to Second! Pages 6 to 11—Puzzle Game - I love this game because all you need to do is print pages 7 to 11 and cut out the cards and you are ready to share this game with your class! Fun to play in small groups of 2-6 students!!! Directions included! Grades PreK to Second!!! Page 12 to 19—Everyone’s Engaged Bingo! The nice thing about this game is that every picture called will be on the card (just in a different order) - this allows for everyone to cover a picture at every turn but still just one winner. (Keeps all engaged knowing they must find the picture on every turn and is not frustrating like regular Bingo.) First person to get four in a row or diagonal, wins! Perfect for preschool, kindergarten, first, or second grade classrooms. BONUS: Play V-day Memory with page 19. Print two pages of page 19. Students can play in small groups, so you will need to print a set of playing card per two—four students. Play like regular memory. Place all cards face down. Students turn over two cards on turn. If they have a matching card, they keep the set and try again. It is the next persons turn when the student does not get a match. Game is over when all cards are collected. Count cards to find a winner. Page 22—Roll a box of BE MINE Chocolates. All you need for this game is a dice and the sheet!!! Added in 2015—Pages 23-26 (Left, Right, Post Office Game). Easy dice game for 3—10 players. Grades 2 and up. Thank you to the artists below for the graphics used in this packet. Please visit their stores!! !